Although the list of Australian screen credits for veteran actor Tony Barry far outweighs his work on New Zealand soil, Barry has been on the ground at many turning points in our country’s screen history. Barry first spent time in New Zealand after arriving from his native Australia for a friend's wedding. As he says, “I came for a week, stayed 11 months”. The stay was the first of more than 120 trips to New Zealand, and it saw Barry successfully auditioning to join the ensemble on early 70s drama Pukemanu. Pukemanu was arguably the first TV series that let Kiwis speak in their own voice. Barry played timber truck driver Dan Harrigan, a unionist who fought for the rights of fellow workers. He would also appear as one of the trio of flatmates in early sitcom Buck House (1974), an “experiment in comedy” which Barry feels suffered from the conservative way the script was put on screen. Barry had first been introduced to Bruno Lawrence and Geoff Murphy on the Pukemanu set. Soon after he began “exploring the perimeters” with them as part of musical troupe BLERTA, short for the Bruno Lawrence Electric Revelation and Travelling Apparition. Blerta would be home on the road and creative melting pot to a shifting collection of actors, musicians and future filmmaking talents, including trumpeter, explosives fan and director Murphy. Barry feels the talents of the latter helped turn the multi-media Blerta concerts into “a magical experience”. When the Blerta team won their own television show in 1976, Barry returned to New Zealand to join in. Excerpts from the show, including Barry’s close encounter with a piano, can be witnessed in compilation doco Blerta Revisited. Barry then appeared in ambitious Blerta quasi-feature Wild Man, “made on an absolute shoestring”. Meanwhile his Australian career was beginning to take off. Among a raft of screen and TV roles, Barry appeared in Australian classic Newsfront, and was one of the soldiers in Vietnam tale The Odd Angry Shot (1979). He then returned to New Zealand to play one of the detectives in Arthur Allan Thomas docudrama Beyond Reasonable Doubt. But the role with which Barry is most associated in many New Zealanders' minds is the classic Goodbye Pork Pie, in which he played the droll John, the man who decides to head to Invercargill to see his girlfriend again. Barry would find himself in the hot seat once more, when he reteamed with Pork Pie director Geoff Murphy for 1988 chase romp Never Say Die. This time Barry played the cop who shows no sympathy for hero Temuera Morrison, but later finds himself on the run with him. In between these Kiwi excursions, Barry was nominated for a Logie award for playing the father of Australian polio victim Alan Marshall in TV’s I Can Jump Puddles, and won a Penguin award for police corruption tale Scales of Justice. 1991 rugby romp Old Scores saw Barry joining a cast made up of rugby and acting greats - and trying not to laugh or ruin the scene during a memorable on-screen monologue by his old Blerta friend Martyn Sanderson, who played a fanatical coach. Barry played a former sports hero battling the demon drink in order to captain the All Blacks in a Welsh-Kiwi rematch, decades after the original event. Scoring “a try in Cardiff Arms Park at 50 years of life, on a 600 mill lens in slow motion” has been one of his career highlights. Barry continued to balance Australian and New Zealand projects during the 90s. The latter included a turn as a cruel foster parent in Garth Maxwell’s dark tale Jack Be Nimble, and joining the cast of Vincent O’Sullivan’s play Shuriken, as evidenced in 1996 documentary Shuriken - Prisoners of Culture. In 90s era TV series City Life he played a greedy developer - corrupt bankers and businessmen are a theme close to Barry's heart. He was front and centre in Geoffey Cawthorne’s Philosophy, which won Best Short Film at the 1999 NZ Film Awards. Barry shines as a jocular undertaker. In 2005 he was nominated for an AFI Supporting Actor Award after playing a senior barrister in Australian mini-series Hell Has Harbour Views. He also co-stars as a security guard in 2009 short film The Ballad of Betty and Joe, which has screened in more than 10 festivals to date. Barry’s career has seen him appearing in many television shows and more than 50 features, from 1976 romance Break of Day to Baz Luhrmann’s 2008 epic Australia. In 2010 Barry got to display his talents (and snare a Qantas Best Actor Award) for a rare starring role: playing the man remembering his soldier past in Gaylene Preston’s Home by Christmas. Barry's recreation of Preston's father was so convincing that after looking at early footage of him in action, a number of potential financers thought that the film was a documentary. Home by Christmas opened to impressive Kiwi box office in April 2010. Later that year, Barry's performance was nominated for a best actor award at the Asia Pacific Screen Awards, which encompass films from 70 territories. Barry can be seen talking about the role of Ed in doco The Making of Home by Christmas, and in this ScreenTalk interview. More Kiwi roles are in the offing. 'The quintessential Kiwi joker: Australian Tony Barry' (Video Interview) NZ On Screen website. 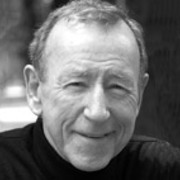 Director Ian Pryor.